India today successfully wrecked the Non-Proliferation Treaty (NPT) regime and got recognised as a de-facto nuclear state when it clinched a civilian nuclear power cooperation deal with the United States. 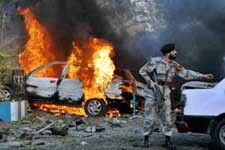 Terror struck Pakistan two days before President George W. Bush's visit, when two near-simultaneous blasts, including a suspected suicide car bomb, ripped through a parking lot near the US Consulate here today killing at least four persons, including an American diplomat, and injuring 50 others. In an embarrassment to the Congress, the RJD today joined Left parties, the SP and the BSP in the protest against the visit of US President George W. Bush to India amid demands for taking both Houses into confidence over pacts inked by the two countries. Activists of the Jammu-based Duggar Pradesh Party, led by its Chairman Dev Raj Baru staged a demonstration against US President George Bush’s visit to India in front of the United Nations Military Observers Group (UNMOG) headquarters here today. The Chief Parliamentary Secretary of Haryana, Mr Dharamvir, has been accused of encroaching upon forest land in Bhiwani. The allegation has come, not from an opposition party, but from the Forest Department. Mr Dharamvir, when contacted, denied the allegation. However, the Forest Minister, Mrs Kiran Choudhary, confirmed the incident. 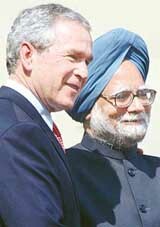 In a world full of cynics, sceptics and petty politicians, Prime Minister Manmohan Singh and President George W. Bush chose to be statesmen, looking ahead to building a new relationship between India and the United States meant for the 21st century.